A guide to be a better sniper. Learn how to wield the ultimate weapon, master the basics, discover new tactics. Be unstoppable! Most of the time you would find people who think using a sniper rifle is very easy and it's very good for offense as it gives you 1 shot kills. If you think this as well, then stop right here and forget everything you know about sniping. 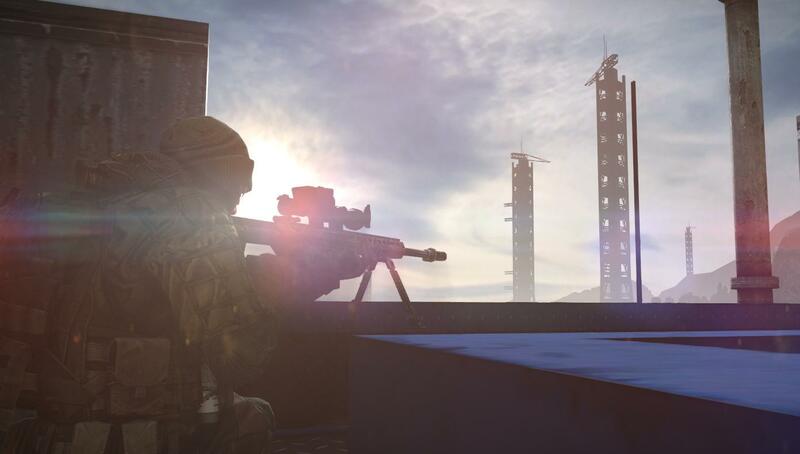 Sniping is one of the most powerful ways of defense in a tactical map and although it can be good for offense but it is most preferred to be used as a defense. Sniper rifles usually grant you 1 shot kills but being a good sniper takes a lot more skill than just endlessly spamming bullets from an assault rifle in comparision. For becoming a good sniper, you need to learn to adapt to your environment. As a sniper, you are most vulnerable in close range but you can be powerful and extensively useful to your team in long range combat. Read ahead on how to improve your positioning and techniques to be most effective sniper on the field. As you might know, there are many good "sniping positions" in every map designed for this game. However, they are not ususally the best place to be for sniping your enemies as they also know about them. So, how do you choose your positions? Well, it's all about keeping yourself safe so you can focus on the sniping. While you are using any sniper rifles, you are left vulnerable in close range as your line of sight in concealed in a scope and anyone can attack you easily from other directions. A good sniping spot is usually the one where you can atleast control 2 directions. You should always choose a spot which protects you from short range attacks and you can be hidden there until you get a chance to kill. Being in the open with a sniper rifle is equivalent to inviting your enemy to kill you. Choose a spot which has walls or opaque objects in the directions you are not observing. Keep your head low and wait for the enemies to come in your line of sight and then its your chance to take action. So, you found a good position and also got some kills huh? Well this is where it gets harder! Many people snipe someone and then are killed relatively quickly. The reason? The answer is that your position is given away almost 90% of the time after you take a shot as the sniper rifles don't have any silencer and the map's design also gives an idea from where a sniper would be shooting. Therefore it's important for you to be fast and adapt to the situation. A good sniper always alters his position after a shot to avoid being targeted easily by enemies who can destroy you with spray of bullets and grenades. Always remember multiple positions for sniping the same area as you might need to change positions to target multiple enemies coming in from the same area. The one mistake you need to avoid is reusing the same position again for a shot. Even if you miss a shot, chances are the target would get alert from the sound and be ready for your next move. The second you expose yourself from the same position, you could be dead. Always keep changing positions and be unpredictable. While using a sniper rifle, it's pretty simple to figure out how to target people. But sometimes the situation arises when you have to be quick or sometimes you have lots of time to plan your shot. So what to do in such cases? Here's the deal. Planned shots are the most simple shots you will take. It is simple. Once you have the target in your sight, you check if there are any other targets near the victim and if not, you take the target out. You can further more try to find other targets through the scope before moving on to a new position to plan your next shot. This is the type of shot you will be most likely taking as most of the average ranked players tend to rush into open areas at the start. Always remember to adapt and to change positions once in a while to avoid being targeted. Many a times, what happens is that your position is compromised as a result of a enemy sniper noticing you or you missing a shot on an enemy. Well there is 2 things you can do in a situation like this. One being a safe player and change your position to avoid being targeted or if you are confident enough to fight the other sniper then you can do a "Quick Scope (Rapid Evade)" shot. What you basically do is that you take the shot to the predetermined spot (where you spotted the other sniper/enemy) and rapidly evade back to a safe spot. This shot is very risky as it guarantees no success and you could be killed instantly by the other person as well. I strongly avoid this shot unless it's an emergency situation. Many people after spotting an enemy, tend to spray sniper bullets (most likely G28E players :D) in the spot they saw the enemy on. This is the most foolish thing ever. The best thing to do is change your positions and in a case of smoke grenades; attack using a grenade and quickly adjust your position as well. People doing blind shots will be most likely killed in the first minutes of the game. No matter how careful you are, situation will arise when you are rushed by an enemy at your sniping position and you have no backup whatsoever. Well in that case, you need to fight in close range yourself. As the sniper rifles don't have any normal crosshairs, it's very hard to get a good shot at your enemy without aiming down the scope. So what do you do? First thing you do is evade. If attacked at close range, try to evade to a safe position as fast as possible. Try to run in random patterns to confuse your opponent and hopefully avoid some damage. You can then try doing some "Quick Scope (Rapid Evade)" shots to take out your opponent but that hardly works as you will be most likely be chased down. You should always using the sniper rifle in close range and quickly shift to your secondary weapon. I usually prefer using Desert Eagle as it has a high power stat. New players might find Rhino pistol comfortable as it has a high stability stat and a pretty good scope as well. Use your surroundings to your advantage and trick your opponent. Use corners wisely. If you are being attacked in a fairly exposed area, you can use smoke grenades to blind your opponent and find time to get far and use your sniper rifle again. Flash grenades also work well but I prefer using smoke. Once you get a upper hand in the close range encounter you can attack an take out the opponent quite easily. Knowing the maps well is the key here. Another thing I reccomend is taking a teammate with you for support. This does 2 things. You can hold on to your position and snipe easily as you don't have to worry about being attacked as you will have a team member to cover you. And, this also helps the other member as you can assist with killing off enemies as most of the time the opponents will try to kill off the non-sniper member first as assault rifles at close range are dangerous. This gives you an edge as you get time to plan a shot and take out the enemy. Get Creative And Keep on Progressing! So once you master these basics, it's an open road for you to experiment with your sniping skills and you will get better and better with experience as well. You can study map structures and pre-plan your action. Once you become synonymous with the opponents usual position, you can then take them out with more and more efficiency. As I said earlier, use the environment to your best!. Distract your enemy, use smoke grenades to create diversions, etc. You can be as creative as you want! In my opinion, these 3 are the best sniper rifles available in the game. Although you can use the one you find most comfortable to handle!